LOS ANGELES â€” Despite multiple last minute changes at the whim of the LAPD and the City of Los Angeles, the 16th annual Global Cannabis March took place on Saturday May 3rd in solidarity with hundreds of cities around the world. Three days prior to the event, the permit holder was informed that construction on the Crenshaw Metro line required a shortening of the parade route. Social networks and phone chains buzzed as the last minute change of plans was communicated to attendees. Considering the hot weather predicted , no one minded learning they would be walking a shorter distance, but not everyone could be informed of the change before the day of the event. The announcement that police would not close the street was delivered after people had traveled from Riverside, San Bernardino, Kern, San Diego, and Ventura counties to assemble in Los Angeles. No one was inclined to move the date of a global hemp revolution event already in progress, so the crowd decided take the sidewalk along the parade route. After a quick reminder for cars to obey all traffic signals and pedestrian marchers to leave passing room on the sidewalk, the march took off towards Leimert Park. Cars covered with sparkly green leaves and messages celebrating the benefits of hemp honked their horns as nearly one hundred people marched on foot. â€œChange Bad Laws: Get on a Juryâ€� declared a banner running the full length of one red sports car. Jury nullification refers to your Constitutional right to vote â€œnot guiltyâ€� on immoral or unjust laws (such as putting human beings in prison for growing or possessing a plant) if you sit on a jury. â€œIf nature is illegal, then freedom does not existâ€� observed a banner on a pick-up truck. Other signs on the truck mentioned the California Cannabis Hemp Initiative 2016 (or â€œJack Hererâ€� initiative), which is the only California initiative to truly repeal prohibition, fully legalize hemp for all uses, and free the pot prisoners. 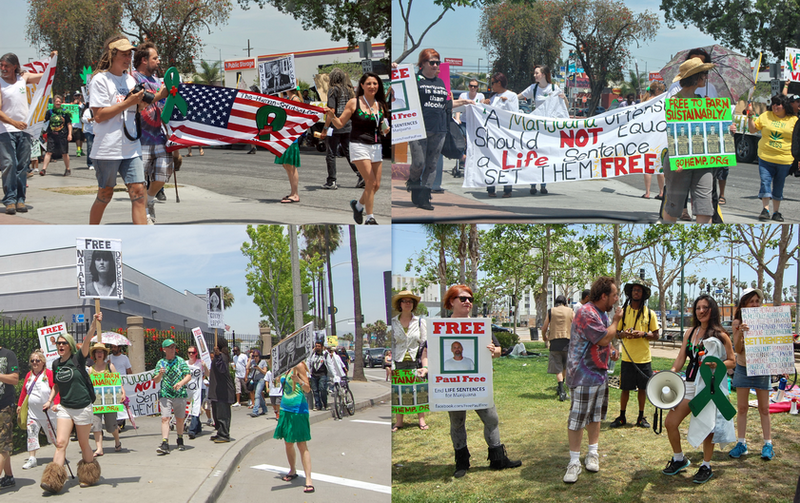 Volunteers from The HumanSolution, NORML Womenâ€™s Alliance, and Orange County NORML formed a contingent to honor cannabis prisoners of war (POWs) serving time behind bars for a plant. As the march traveled along Crenshaw Boulevard, 3-foot tall signs bearing the pictures of marijuana POWs caught the attention of passerby and traffic. An 8-foot wide banner spanning the sidewalk pleaded â€œA Marijuana Offense Should Not Equal a Life Sentence. Set them Free!â€� Another sign listed the names of 22 people serving life sentences for marijuana. Also represented in Saturdayâ€™s Global Cannabis March were prisoners who were convicted in federal court despite complying with California state medical marijuana laws. Aaron Sandusky, Luke Scarmazzo, Roger Christie, and Eddy Lepp were among the federal prisoners depicted on signs. Hemptivist Dr. Mesmer carried a â€œPhytoremediate Fukushimaâ€� sign in the march. Phytoremediation is the process of using plants to clean a toxic environment. Large scale hemp planting has the potential to reduce air pollution and scrub toxic substances from the soil. A single LAPD squad car escorted the march down Crenshaw. The officers did not cite anyone for pedestrian violations, despite photographers stepping into the road to take pictures. The decorated vehicles accompanying the parade were permitted to travel below the legal minimum speed. This yearâ€™s cannabis march was dedicated in loving memory of Richard Davis of the USA Hemp Museum (who passed away this year) and Sister Somaya Kambui. Both brave cannabis pioneers produced the early Los Angeles global marijuana marches and contributed to the event until their passing. Sister Somayah would open the rallies with her battle cry, â€œDonâ€™t Be Scared,â€� and she always carried a hemp plant with her in the parade. Medical marijuana pioneer Richard Eastman greeted the march at Leimert Park. He returned from Washington, D.C. to attend the march, but did not receive notice of the last minute formation change. Another hempster noted, â€œIt is way past time for We, the People to take back our relationship with Mother Nature. The Human Solution founder Joe Grumbine, a veteran of a four year court battle for operating a Long Beach dispensary, spoke about the need to channel energy into contacting our elected representatives. â€œHow many of you know the name of your representative?â€� he challenged the crowd. We, the People vote in the Congress that has the power to make laws. We all know that the majority of the public disagrees with the Drug War, so why do we allow it to continue on? It is time to make our law enforcement system representative of the will of the people. Itâ€™s time to end Prohibition.